African American migratory workers by a juke joint in Belle Glade, 1941. 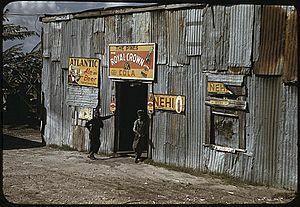 Photo by Marion Post Wolcott. Belle Glade (and the surrounding area) is sometimes referred to as "Muck City" due to the large quantity of muck, in which sugarcane grows, found in the area. About half the sugarcane in the nation is grown in the plains around Belle Glade and nearby Clewiston. Despite being located in the South Florida region of the state, Belle Glade is culturally more associated with the Florida Heartland. For a time during the early to mid 1980s, the city had the highest rate of AIDS infection per capita (37 cases in a population of roughly 19,000) in the United States. According to the FBI, in 2003, the city had the second highest violent crime rate in the country at 298 per 10,000 residents. Belle Glade is located at . According to the United States Census Bureau, the city has a total area of 4.7 square miles (12 km2), of which 4.7 square miles (12 km2) are land and 0.21% is water. The existence of Belle Glade is related to the federal project of draining the land around Lake Okeechobee, the acreage to be used for agriculture. The town was built in 1925 and destroyed three years later by a hurricane which killed thousands of people. The town was subsequently rebuilt. The area around Lake Okeechobee is fertile and farming has been an important industry. Many migrant farmworkers from Belle Glade appeared in the 1960 television documentary, Harvest of Shame. Men and women still gather around 5 a.m. in the same lot you see at the beginning of Harvest of Shame, waiting for buses to take them to the fields. The "loading ramp," as it's called, is a bleak, empty lot, surrounded by some small buildings with bars on the windows and a boarded up storefront. As of May 2014 the city has plans "to demolish the loading ramp and turn it into a park." The town is known for its football tradition, and together with nearby Pahokee has "sent at least 60 players to the National Football League". The Lake Okeechobee Scenic Trail runs through Belle Glade. As of the census of 2000, there were 14,906 people, 4,854 households, and 3,431 families residing in the city. The population density was 3,206.2 inhabitants per square mile (1,237.7/km²). There were 5,374 housing units at an average density of 1,155.9 per square mile (446.2/km²). The racial makeup of the city was 13.8% White (non-Hispanic), 50.68% Black or African American, 27.57% Hispanic or Latino of any race, 0.17% Native American, 0.19% Asian, 0.04% Pacific Islander, 9.70% from other races, and 8.93% from two or more races. There were 4,854 households out of which 39.0% had children under the age of 18 living with them, 40.9% were married couples living together, 22.0% had a female householder with no husband present, and 29.3% were non-families. 23.3% of all households were made up of individuals and 6.1% had someone living alone who was 65 years of age or older. The average household size was 3.04 and the average family size was 3.62. In the city, the population was spread out with 33.5% under the age of 18, 10.0% from 18 to 24, 27.1% from 25 to 44, 20.7% from 45 to 64, and 8.7% who were 65 years of age or older. The median age was 30 years. For every 100 females there were 103.5 males. For every 100 females age 18 and over, there were 102.6 males. The median income for a household in the city was $22,715, and the median income for a family was $26,756. Males had a median income of $26,232 versus $21,410 for females. The per capita income for the city was $11,159. About 28.5% of families and 32.9% of the population were below the poverty line, including 41.1% of those under age 18 and 21.4% of those age 65 or over. As of 2000, speakers of English as a first language accounted for 61.03% of all residents, while Spanish as a mother tongue consisted of 26.87%, Haitian Creole comprised 11.00%, and French made up 1.07% of the population. 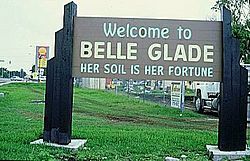 As of 2000, Belle Glade had the tenth highest percentage of Haitian residents in the United States, at 11.50% of the populace. In CBS Reports' 1960 program Harvest of Shame, Belle Glade plays a prominent role as a source of migrant agricultural labor. The final scenes of the crime novel Pretty Little Things by Jilliane Hoffman take place in a sugarcane plantation near Belle Glade. The high school football culture of Belle Glade is the subject of the non-fiction book, Muck City: Winning and Losing in Football's Forgotten Town by author Bryan Mealer. The psychedelic pop band of Montreal released a track titled, "Belle Glade Missionaries" on their 2013 album, Lousy with Sylvianbriar. In Zora Neale Hurston's novel "Their Eyes Were Watching God" characters Janie and Tea Cake join other African American migrant workers in picking beans in Belle Glade. Ovaska, Mark, "The Way Out", New York Times, February 2, 2013. "In Muck City, football is salvation, an escape from the likelihood of prison or early death." 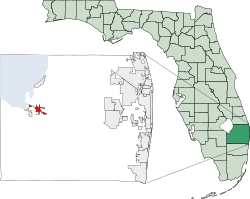 Belle Glade, Florida Facts for Kids. Kiddle Encyclopedia.